For many industries, lengthening the lifespan of essential machinery is a critical concern. 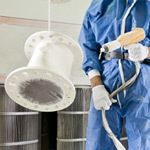 Logically, powder coating is a time and cost-effective way of doing so. Of course, this process has to be done right to be worthwhile, which is why a phosphate pre-treatment process is considered a key element of any preservation policy. A first glance, it might seem that the regular cleaning is sufficient before powder coating because it removes the oil and dirt build-up, as well as welding scale and a host of other soils. But even with the surface cleaned thoroughly, adhesion can still be improved. Powder coating is one of the surest ways of preserving a mechanical part, offering greater protection than a regular paint job. That is because the polymer that is sprayed onto the surface is more durable and more adhesive than conventional paint is. The powder used for the coating could be a type of thermoplastic or a thermoset polymer, but when cured under heat it develops a skin that creates a hard finish. But how does phosphatizing make a difference? Why is it such an important part of the process? There are several points that underline why. In essence, the process subjects a metal to an acid that attacks the surface before a material containing the metal substrate and phosphates settles back down onto it. The result is an inert surface that is microscopically rough. As a result, the surface offers more effective bonding, which can be maintained even after being scratched. This means there is a very small chance of flaking or peeling, so the risk of moisture and air making their way under the coating – and therefore rusting – is reduced dramatically. Phosphatizing is carried out after the surface has been cleaned thoroughly with the use of a proven alkaline-based chemical cleaner. The cleaner contains surfactants to lower surface tension, with the spray pressure and water temperature both key considerations. The second stage is a rinsing stage, when the soils are removed. Then attention can be turned to the phosphate pre-treatment. Improved Powder Coating Adhesion – the treated surface is made rough, and therefore makes sticking not just easier but more effective. Improved Coating Base – because of greater adhesion, the metal part is more effectively protected and a longer useable life. Improved Corrosion Inhibition – with the powder coating sticking more effectively, air and moisture are both more effectively locked out. Thus, the risk of rusting and corrosive damage is drastically reduced. Improved Finish – with the coating sticking so effectively it envelops the metal surface, the quality of finish is also improved. And with a smooth, uniform finish, cleaning becomes easier too. Neutralizes Surface pH – leaving a metal surface untreated leaves it susceptible to a host of faults that allow negative and positive charges to coexist. Generally, there are 2 phosphate options to choose from, but the correct one is dependent on such factors are the material the particular surface is made of, the elements the surface needs to resist (like salt or UV rays), and the budget you have to work with. 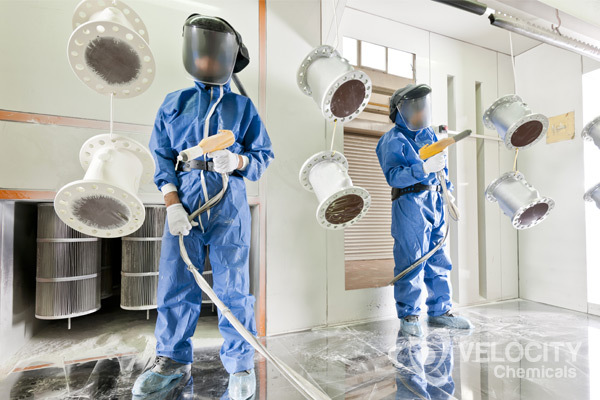 As a leading name in the formulating and manufacturing of chemical degreasing, cleaning and metal preparation products, we at Velocity Chemicals understand the importance of properly preparing metal surfaces before powder coating. PREP RITE – a heavy duty, high foaming caustic cleaner for the removal of oils, greases and light scale from metals prior to phosphate coating or painting. ADHERE – specially formulated pre-paint treatment primarily developed for economical steam or high-pressure phosphatizing of large ferrous and other metal components. Velocity Chemicals is known for providing high-quality finishes across North America and doing so with a quick turnaround time and excellent customer service. Our experienced team has the expertise that you need in order to achieve a perfect powder coated finish. To find out more about how Velocity Chemicals can help maximize your powder coating results, talk to one of our specialists at 1-888-963-9499, or email us today! mobile washing for 25 yrs. use brushless primarily. wondering about your products and availability. Let's learn more about each other. Let's get connected! Your Privacy is Guaranteed. We will never give, lease, or sell you personal information. Period!